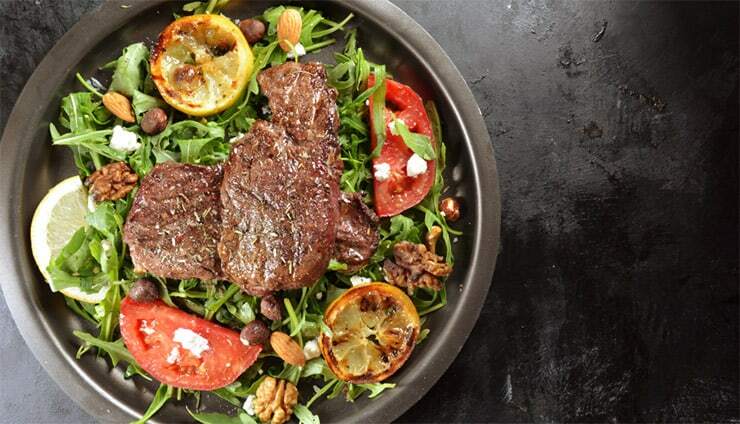 Healthy, colourful, and delicious – those are the three words that come to mind when I talk about this beef steak mix. Combination of different flavours is what makes this salad a perfect lunch, snack, or even a fancy dinner for an unexpected family reunion. Nuts give this combination a special kick, but make sure not to overdo it. You don’t want your steaks to be too nutty. This formula has to be just perfect. Remove the steaks from the refrigerator about 30 minutes before grilling. Cover and let them sit at the room temperature. Spray the grill with some cooking spray and preheat to high heat. Grill for 5-7 minutes, or until lightly charred. Turn over and continue to cook for another 4-5 minutes for medium-rare. Remove from the heat and cool for about five minutes before slicing. Whisk together red wine vinegar, dried thyme, and olive oil. Set aside. In a large bowl, combine together arugula, goat’s cheese, almonds, and walnuts. Top with steaks and drizzle with the vinegar mixture.